Do you sign autographed headshots? Yes. Who responds to viewer email, you or someone writing for you? Although it may take a while, I personally reply to them. Do you have a myspace page? No. Lunch? Thank you, but they are respectfully declined. Shorter emails get faster replies, too. I love hearing from you! So , keep the emails coming. Here is our morning show Director, Rusty, who we sometimes refer to on-air. He’s definitely in the Christmas spirit! 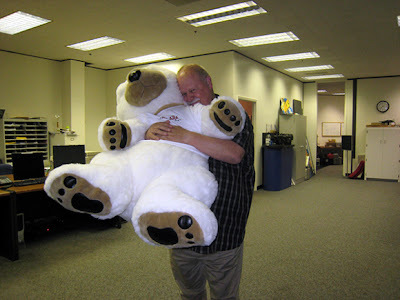 I’m not sure who is more huggable. So, you are probably dropping by to hear about the Holiday Party details. It all began last year when Anthony and I sat at the same round table with about 8 of our co-workers. We were talking about how nice the centerpieces were. Anthony noticed that from my point-of-view all I could see was the back side of the decor. So, he kindly proceeded to turn the cookie bouquet which was filled with tissue paper, as you can see in the first picture of the slideshow. You might have also noticed the candles surrounding the centerpiece. So, when Anthony turned the bouquet around, wwwhhufff; the tissue paper caught fire. We all jumped up and started pouring our drinks on a small fire that was about to get out-of-control. Luckily it didnt grow any larger or our sprinkler system might have turned on. Needless to say, this year’s holiday party included fire jokes. Anthony and I were banned from sitting together at the same table and tissue paper was nowhere to be found. Now this is Edgar who seems to recall that I started the fire…well, he’s just picking on me. This holiday season, Finger Furniture teamed up with KPRC Local 2 for “Season 2 Give.” In addition, many of you came by our Channel 2 Studios, to drop a gift off as well. We sincerely thank you for your contribution and help. Our aim is to give back to the community, by providing children with toys or gifts to brighten up their holiday season. Friday, December 7th, I emceed an event that KPRC and I are proud to be a part of, The Gift of Time Gala. This gala, Gone Wild, was a benefit to help the Muscular Dystrophy Associaton Research Program. It featured dinner, a silent auction and guests contributed donations to sponsor research. There was a Wild Kingdom Theme (Gone Wild) for this year’s event. “Jen, you are emceeing…how fitting,” adds one of my colleagues. I guess I will take that as something to celebrate. I did and needless to say, the evening was a delight. I met so many nice people like Annie and Renee from MDA. Shorty, Traci and Chad – the auctioneers. Firemen – Dennis and Richard. Willis, who rides the Katy and watches us in the mornings. The couple from Ketel One. Curtis – the photographer. Angela – former Ms. Wheelchair Texas 2004 and teacher. Jacob – an inspiration. And many others!